Can the Phillies' payroll afford Jayson Werth? In our last article examining the Phillies payroll, we found that allowing Jayson Werth to walk essentially maintains the same payroll of $141 million next season. Re-signing Werth would simply ADD Werth’s salary on top of the $141 million. It originally seemed like $15 million would be enough to keep J-dub. But after listening to Werth's agent Scott Boras on the radio it sure seems like it would take something in the range of $17 million per year to keep Werth in Philadelphia. Other than simply increasing the payroll to $156 million or so (which you know the Phillies owners won’t do), the only possible way to keep Jayson Werth is to make a trade. Making room for $15 plus million is no easy task and there are really only two trades I can think of to keep Werth in Philly without simply adding his salary. Trade Chase Utley, keep Jayson Werth, and find someone (maybe Valdez) to replace Utley. Rationale: This trade ONLY happens if Ruben Amaro values Werth over Utley. They both will make roughly the same amount next season, making this more of a facelift than an upgrade. Chase Utley has not played up to his potential over the last two season and it is certainly more than valid to question whether Chase’s best years are behind him. It would also give you flexibility with Raul Ibanez. A team might be willing to take on a portion of Ibanez’s contract if he is coupled with Utley and then you can platoon Brown and Francisco. Or you could keep Ibanez and have an open competition in left field. Negatives: YOU LOSE CHASE UTLEY! This guy is still one of the premier second baseman in baseball and one of the main core players on the Phillies. Trade Jimmy Rollins and Raul Ibanez, platoon Brown and Francisco in left, put Valdez or someone else at short, and keep Werth in right. Rationale: If a team takes on $4.5 million for Ibanez and you trade Rollins (who will make $8.5 million in 2011), that would give the Phillies $13 million to pay for Werth. Jimmy's game has seriously declined in the last two seasons and Valdez is more than capable to play shortstop and he was decent at the plate. It might be tough to deal Ibanez alone, but packaging him with J-Roll might entice some teams. Positives: Pretty much the same as with trading Utley. Negatives: Say what you want about Jimmy's game, but he is the heart and sole of the Phillies. Trading Rollins could kill the "mojo" that has sent the Phillies to three straight NLCS series. Jimmy Rollins has the second best fielding percentage among shortstops of all time. Despite how well Valdez played in the field, he is no Jimmy Rollins. If you don't like those terrible trade ideas, it might be time to consider life without Werth. If Werth goes, Domonic Brown is set to replace him. The obvious flaw with that system is that it adds another lefty to an already lefty-heavy lineup. One way to resolve that issue is by trading Ibanez, which we already figured would only save you about $4.5 million. Even at $4.5 million, there may not be many buyers out there anyway. Trade Ibanez, put Brown in right, Franciso in left, and use the money from Ibanez elsewhere. Rationale: The Giants once again proved that pitching wins in the playoffs. Removing Ibanez from the picture gives Amaro flexibility to shop around for a reliever, a fifth starter, or maybe bulk up the bench. Positives: If Brown and Francisco shine in 2011, that's a pretty good, cheap outfield. That's about all that I like about this option. Negatives: How does Francisco, Victorino, and Brown sound to you? It may pan out down the road, but this outfield could very well waste a golden opportunity in Philadelphia Phillies history. Trade Ibanez, get another outfielder like Cody Ross to replace him, and platoon Brown and Francisco in right. There are plenty Cody Ross types available (as much as I hate using his name) who could bat in the middle of the lineup from the right side. Rationale: You can dump Ibanez while getting something in return. Platooning Domonic Brown and Francisco is the best utilization of both players. This is by far the best option in my mind. Positives: Without trading Ibanez, the Phillies lineup would likely feature four straight left-handed batters 3 through 6 in the lineup. A Cody Ross type could offer some protection behind Howard for a fraction of the cost of Werth. Domonic Brown is hopefully a future face of the franchise. Platooning him Francisco not only eases Brown into the majors, but it gives Francisco more playing time. If Brown struggles and your Cody Ross type underperfoms, the Phillies could have a very average offense tin 2011. Jayson Werth's bat has been such an important part of the Phillies' recent success. Losing him would not only drop your biggest bat from the right side, but you lose his power, speed, defense, and ability to hit with two strikes. But the fact remains that the Phillies cannot afford him. What Ruben Amaro does to replace Werth could very well define his legacy in Philadelphia. It's hard to believe that losing a first base coach would make headlines. But Davey Lopes' announcement that he is leaving the Phillies could have a serious impact on the Phils. I always considered the first base coach's role to be little more than reminding base runners how many outs there were in an inning and pointing out the hot girls in the stands. That was before Davey Lopes came to the Phils, at least. Lopes had an incredible knowledge of the tendencies of all pitchers and knew exactly when to send the runners. He would find the "tell" in a pitcher's delivery that only he could see and pass it along to the players. Davey Lopes had an immediate impact on the Phillies' running game when he joined the Phillies in 2007. The Phils led the major leagues in stolen base percentage in all of his four seasons. They finished with the best stolen base percentage in MLB history in 2007 at 87.9%. It might be easy to attribute that success to the players, but consider that the Phillies improved from 6th in steals with a 78.6% stolen base percentage in 2006 to 4th in steals with an 87.9% rate a year later under Lopes. The below chart shows just how successful Lopes was at his profession. The Davey Lopes effect also breaks down to the individual level. Each of the Phillies main base stealers (Rollins, Victorino, Utley, and Werth) showed gains with Lopes. Those four players improved from 80% prior to Davey Lopes to 87% during his tenure. He had the biggest effect on Victorino, who improved by 13 percentage points. That is what makes it so puzzling that the Phillies would just let Davey walk. Ryan Howard drops more money in the toilet than Davey Lopes makes for an entire season. Heck, they could hire three Davey Lopes for the $750,000 they will pay to buy out JC Romero. Davey says this was not just about money (although I doubt it). There is a "tier of importance as to how you pay your coaches," Lopes explained on the radio. "Pitching coach, hitting coach, bench coach, third base coach, and then first base coach....that's the pecking order." He said the Phillies made a "pretty good offer," but clearly not enough for him to stay. We all know the Phillies 2010 offense performed well below expectations. Overall, the Phillies finished 2010 with a .260 batting average with 166 HR and 736 RBIs as opposed to their 2009 statistics of a .258 batting average with 224 HR and 788 RBIs. They were two points higher in batting average, but hit 58 less home runs and 52 less RBIs. But just how much worse were the Phillies offensively? To answer that question, first we look at the entire team numbers. Overall, the Phillies finished 2010 with a .260 batting average with 166 HR and 736 RBIs as opposed to their 2009 statistics of a .258 batting average with 224 HR and 788 RBIs. They were two points higher in batting average, but hit 58 less home runs and 52 less RBIs. Next, I decided to take the 2010 statistics of the Phillies' main offensive pieces and compare them to their career averages. In this case, we examined their averages, home runs, and RBIs. Since injuries caused most of the Phillies regulars to miss a significant number of games, we prorated the home run and RBI totals over 162 games. 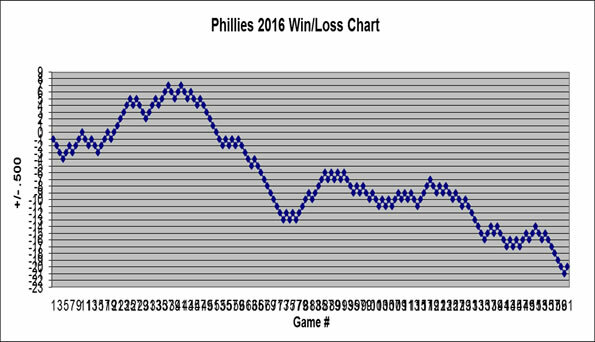 As you can see from the below chart, every player except Ruiz and possibly Victorino played BELOW their career averages. Carlos Ruiz was the clear and only true winner in this group, hitting 42 points better than his career average with slightly more homers and RBIs. It was a close race for biggest loser between Ryan Howard, Chase Utley, and Jimmy Rollins. I would give the award to Utley, who dropped by 18 points in average, 6.5 HR, and 13.4 RBIs. Utley dropped consistently across all categories, causing definite reason for concern. Another cause for concern was Jimmy Rollins, whose average dropped 29 points to go along with 2.3 less homers and 3.5 more RBIs. J-Roll was plagued with injuries all season, so we can just hope that this was just an anomaly. Ryan Howard is simply a victim of his own prowess. His homers and RBIs were way down, but to finish with a prorated 35 homers and 122 RBIs on an "off-year" aint all that bad. Shane Victorino had an interesting season. His 2010 power numbers destroyed his career averages, compiling 6.8 more homers and 16 more RBIs. But that power came at a cost and his batting average dropped 20 points. As bad as that may seem for a player with Shane's speed, many of his homers came during stretches when the Phillies weren't scoring many runs at all. You can expect more on this throughout the offseason. As a follow up to the last article where we compared the Phillies career and 2010 hitting stats, we now turn our attention to the pitching. As strange as this might have sounded a year ago today, the Phils pitching carried them in 2010. A big reason for this success is that most of the Phils' pitchers outperformed their career numbers. As we did with our offensive analysis, we limited our focus to the main contributors. In this case, we compared the 2010 ERAs of twelve Phillies pitchers to their career stats. You can see from the following chart that the total ERA dropped by a total of 3.84 points in 2010, which works out to an average drop of 0.32 per player. That may not seem like much, but it helped improve the entire staff ERA from 4.16 in 2009 to 3.68 in 2010. The stats get more interesting when you break it down between starters and relievers. What we found to be a bit surprising was that the biggest improvement came out of the bullpen, not the starting rotation. The bullpen improved by 0.46 per player and the starters only improved by 0.10 per player. Since nearly every Phillies pitcher improved in 2010, we could only narrow it down to 6 players. Let's start first with the starters. Roy Halladay had the largest improvement at 0.88. We can't ignore the fact that he switched leagues, but this season the National League ERA at 4.03 was only 0.11 lower than the American League at 4.14. Not only did the Phillies pick up the best pitcher in baseball, but we got an improved version. In second place is Cole Hamels. After a difficult 2009 season, Cole Hamels shut up all of his critics by improving 0.47 in 2010. Roy Oswalt improved also, with a 2010 ERA which was 0.42 points better than his career. The bullpen winners were Ryan Madson, Chad Durbin, and Jose Contreras. Durbin seems to get overlooked, but his agent will not overlook his drop of 1.25 points over his career ERA. Jose Contreras answered questions about how he would do in the bullpen after a career as a starter by dropping his ERA 1.21 points. Then there is Ryan Madson. Mad Dog has enjoyed plenty of success in his career, but this might have been his greatest season and he improved by 1.16 points. Although Joe Blanton took a step back last season, the "Biggest Loser" was Danys Baez by a landslide. Baez had closing experience and some success in a career in which he pitched primarily in the AL East. He was no good to the Phillies and an obvious mistake by Ruben Amaro. Baez had an ERA of 5.48, which is 1.34 points higher than his career ERA. No wonder Charlie to leave him off the postseason roster. It's a shame the offense couldn't get it together, because the pitching was tremendous in 2010. The good news is that just about all of them are going to return next season. Earlier this month we compared the Phillies hitters 2010 numbers with their career stats. Now, we will see how last season compared to 2009. As a team the Phillies finished 2010 with a two point higher batting average (.260) with 58 less HR (166) and 52 less RBIs (736). But how did they do individually? We have plenty of time to super-analyze the stats later, but for now we will take a more global look. The below chart shows the major offensive statistics for the starters at each position. The big improvements are highlighted in yellow and the larger declines are highlighted in red. "Why aren't all of Howard's, Utley's and Rollins' stats highlighted in bright red?" you might ask. Well, it wouldn't make much sense to highlight any stats that are effected greatly by the number of games played, like RBIs, home runs, runs, etc. Of course J-Roll is going to score less when he played 67 less games, so we didn't highlight those stats. Carlos Ruiz had the best improvement from 2009. Ruiz hit .302 with a .400 on-base percentage, 30 more hits, 10 more RBIs, and 11 more runs. Ruiz emerged as much more than a good defensive catcher. The decline in power from our big boppers is quite alarming. Howard's slugging percentage dropped by 66 points and Utley's dropped 63 points. Injuries might have played a role, but that is a significant dropoff from two of our premier players. And don't forget Ibanez, who saw a drop of 108 points. Shane Victorino had a weird season. His average and on-base percentage both dropped over 30 points, but he had 9 more home runs and 9 more steals in 9 less games than 2009. Greatest Phillies player: Ryan Howard or Mike Schmidt? Who is the greatest Phillies player of all time? If you were to ask this question ten years ago, the most common answer would be Mike Schmidt. And why not? He leads the Phillies in games played, hits, runs, total bases, walks, home runs, and RBIs. But if you ask this same question in another ten years, the answer will be Ryan Howard. Over the next few weeks, we see how the Phillies current core of Jimmy Rollins, Ryan Howard, and Chase Utley measure up with the all-time Phils' greats. We naturally begin with the big boppers: Mike Schmidt and Ryan Howard. Obviously Mike Schmidt is going to win virtually every offensive category since he played 18 seasons compared to just 7 for Howard. Therefore, we won't waste our time on the career totals. "The Big Piece" beats Schmidt in nearly every major offensive category. He averages 10 more homers and 31 more RBIs per season. Howard is 12 points higher in batting average, 45 points higher in slugging percentage, and 36 points higher in On-base plus slugging percentage (OBP). Howard doesn't completely outweigh Schmidt, though. Schmitty averages 10 more stolen bases, 16 more walks, 65 less strikeouts, and his OBP is 9 points higher. We also left out the fact that Mike Schmidt might be THE BEST DEFENSIVE THIRD BASEMAN OF ALL TIME and Howard is an average fielder at first base. Overall, Howard is clearly better in the power numbers, but Schmidt gets on base quite a bit more and strikes out significantly less. Finally, here are their career totals. Schmitty wins easily considering he played 11 more seasons than Howard. You can expect Howard to shatter these numbers if he can remain healthy. The numbers do not lie. Howard is far better at this point in his career than Schmidt. Granted, Howard plays in the "live ball era" and isn't half the defensive player, but he is making it harder and harder to argue that Schmidt is the best Phillies hitter of all-time.